After visiting the bottom of the Atlantic Ocean in August 2005, scientists have discovered that Titanic took just five minutes to sink – much faster than previously thought. The scientists also discovered that after hitting an iceberg, the ship split into three pieces. During their visit they found two large pieces of the ship's hull half a kilometer away from the stern. 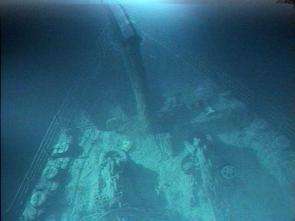 Before this discovery, experts had believed the hull was shattered into hundreds of pieces and that Titanic had split into two halves as depicted by James Cameron's 1997 movie. The two large pieces discovered in August were in good condition, measured 12 meters by 27 meters and were coated with red paint. When Titanic's wreck was first discovered in 1985, scientists reported the hull remained missing. According to Roger Long, a naval architect who studied the recent discovery, the vessel hit the iceberg and the hull broke loose before the stern split. He said the ship only took five minutes to sink. Before the August expedition, David Brown, a Titanic historian had said the stern took twenty minutes to plunge into the ocean. Measured at 46,000 tons by its builders, Titanic was branded as unsinkable by most media of the early 1900s. After two and a half hours into its first voyage, the gigantic vessel hit an iceberg and made its way in pieces to the bottom of the Atlantic on April 14, 1912. The disaster claimed 1,500 lives and the ship remained missing until Robert Ballard, a twentieth century explorer, found the bulk of the wreck in 1985. The broken pieces remained lying at a depth of 13,000 feet below sea level and some 380 miles southeast of Newfoundland. After the August trip, Ballard said, "They found a fragment. Big deal. Am I surprised? No. When you go down there, there's stuff all over the place. It hit an iceberg and it sank. Get over it." The expedition was financed by the The History Channel, who have scheduled a single piece documentary on February 26th 2006 to present the findings.